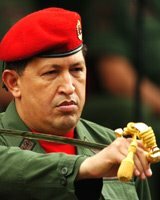 "Hugo Chavez is better known for his hyperbolic statements—he calls President Bush 'Mr. Danger' and labels Israel's campaign in Lebanon a 'new Holocaust' (Miami Herald)—than his diplomacy. But a recent world tour (SFChron) marked by visits to Belarus, Russia, and Iran suggests the Venezuelan president's foreign policy ambitions may be just as outsized as his rhetoric. Among the many reasons for his trip—lobbying for a temporary seat on the UN Security Council (BosGlobe), arms purchases, and strengthening relationships with anti-U.S. leaders of several countries at odds with Washington—one dominated: energy deals. In Russia, President Vladimir Putin appeared cool to requests to fund a South American oil pipeline, but in Iran, calls for oil investment in Venezuela's Orinoco region fell on more responsive ears. On July 30, Iran's state-owned oil company agreed to invest some $4 billion in two Venezuelan oil fields (WSJ).